One of the few working payphones left in Albany, NY. It may say Verizon, but the real carrier is Pacific Telemanagement Services, visable above the phone if you look closely. A payphone "shell" in Albany. Note the lack of a phone. Another Albany payphone, now getting more use as a trash can than a phone. Another shell. The ripped-out wires are visable in the cavity at the top. Have you ever used a payphone? Until recently, I hadn’t. The closest most millennials have been to using one is that Maroon Five song that came out a couple of years ago. But even in 2017, public telephones—and those who make them—are still hanging on. Not by much, though. They’re fading further into obscurity with every new smartphone. Is there still room in our digital world for the humble payphone? If so, where? Alan Rothenstreich is Director of Special Projects at Pacific Telemanagement Services, or PTS, one of the last remaining large-scale payphone operators in the United States. He says the number of public telephones in the country has decreased by about one thousand percent since he joined the industry in 1986. “There’s probably less than a hundred…less than a hundred thousand," said Rothenstreich. The drop began in the early 2000’s, as cell phones became more mainstream. The decline picked up in 2009, when AT&T officially exited the business. Other major carriers followed suit, and in 2011, Verizon became the last major carrier to call it quits. Now, most payphones are owned by private companies like PTS. But where are those few remaining payphones? On Central Avenue in Albany, NY, I had seen several, and assumed they were still in use. Upon further inspection, though, I realized almost all of them are just shells. I did find a working one outside an apartment building. I asked several people nearby if they’d ever used it, or any other payphone in the city, but the only person I met who had used an Albany payphone wasn’t even a current resident. Marcus Allman, who was visiting for the weekend, said he hadn’t used a public telephone since high school. Even as Allman discussed payphones, he was holding a cell phone. It’s actually not too surprising that there aren't more payphones on Central Ave. The ubiquity of cell phones combined with decent service makes cities impractical homes for them. More often, they’re in places that don’t have strong cell coverage, like rural areas and national parks. But according to Walter Goff, Director of Sales and Marketing at G-Tel Enterprises, the largest private payphone provider in North America, the biggest demand for payphone manufacturers is elsewhere. Actual payphones only make up a small fraction of G-Tel’s sales. In other words, most of the phones that would be payphones…aren’t. At first, prisoner phones might seem like an odd savior for the industry, but their unique purpose means they aren’t suited to being replaced by cell phones or other types of voice communication. Even outside prisons, there are some places where cell phones just aren’t reliable enough—like hospitals. Jeffrey Gordon, Vice President for Communications at Albany Medical Center, says even though most hospital visitors don’t think of public telephones as a crucial resource, they play an important role. “Our main goal is to ensure that our patients and their families have all of the resources they need to be well cared for, and so much of what is involving care is ensuring that family and friends who are not on site can be kept in the loop with any kind of medical development," said Gordon. And to ensure that, some form of dependable communication is needed. But outside of hospitals and prisons, Rothenstreich says people tend to think public telephones are, quote “about as relevant as the Victrola”—which is a phonograph—“and dinosaurs.” Still, he says, they have other uses that cell phones can’t replicate yet. “They’re becoming more or less the lifeline in locations that are no longer easily accessible, such as rural areas, parks... other areas where cell phones may not work, or the coverage hasn’t been built out there yet,” said Rothenstreich. The term “lifeline” can be literal. Rothenstreich recalls one instance in which a 16-year-old boy who had run away from his South Carolina home and ended up in San Diego, CA. He was tracked down after making a call from a PTS phone. The boy was distressed, Rothenstreich says, and called his girlfriend from a public library to tell her he was contemplating suicide. She called the police, who tracked the number to PTS. PTS staff members were able to provide information the FBI then used to find the boy. Rothenstreich says it would have been much more difficult to find the boy had he called from a cell phone. Rothenstreich recalls another incident in which a woman fell into a rapidly-moving stream while hiking in California's Sequoia National Park. Her brother was unable to call for help on his cell phone because there was no service, but was able to hitch a ride to a nearby payphone. 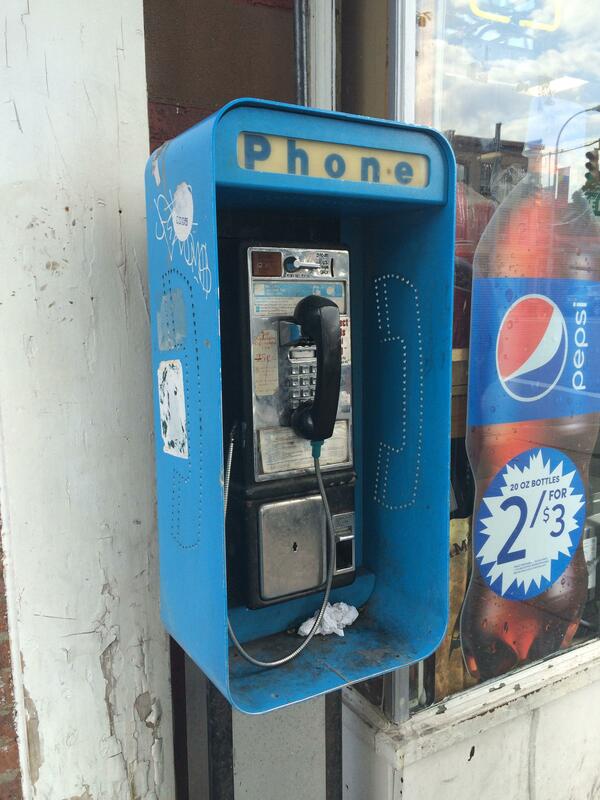 “Someone called the police from the payphone, they were able to describe it, they reached out to us to find out the exact location, and then they were able to go to that exact spot,” said Rothenstreich. So does this street corner staple still have a spot in society? Goff says it does for now, but he isn’t sure for how much longer. Rothenstreich, however, isn’t writing payphones off yet. “My vision of it would always be that there’s still that handset with that hard, solid line so it’s there in an emergency, which was always the purpose of it—that it’s there when it’s really needed, as the most reliable form of communication and for those that need it right then and there," said Rothenstreich. As long as there are areas cell coverage can’t reach, he said, good old-fashioned public telephones will be around when we need them the most. WAMC News intern Erin Meyer is a senior at SUNY Oswego. She is majoring in Broadcasting and Mass Communication, and Political Science.